I'm working on System 246 covers for PS2 games case. Did somebody knows what is the font use for the title of the games on the side of the covers ? I'm gonna take a look at it. If somebody know some websites with good quality scan for PS2 covers it could be very useful. EDIT: It's possible to identify a font with a simple picture on some websites. The post was edited 6 times, last by eathis ( Sep 19th 2018, 3:10pm ). Try the cover project, it has tons fo scans for PS2 in good quality and for different region variants depending on the title. 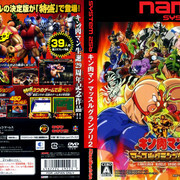 Thanks Sjlewis78, I've already found this site but unfortunaltely a lot of games are missing, especially the games only edited in Japan versions like Kinnikuman Muscle Grand Prix 1 and 2. For these ones I used google image and another site. I only found low quality scans for some games but I guess it's ok I'll try to do something with it. The post was edited 1 time, last by eathis ( Sep 19th 2018, 11:21pm ). I had done muscle covers too, and recall running I to the same issue of no quality source art. Here are the first versions I made for Kinnikuman MGP 1 and 2. I save the files in JPG to upload it easily, the real files are in better quality. About the title wrote in japanese I did it because I'm still searching for a font similar to the original one. As soon as I found it I will certainly made another version with the title in US. I try to inprove the quality by changing many setting, that's not perfect but that's not so bad. OK to get the quality up to printing they probably need to be around 300 pixels. It's going to make the file larger but it will be more detailed. Like that this is ok for me, I will print it with my usual printer and check the result. You talk about the originale files found on the web or you talk about the covers I made?